Researching personal loan options? Then you’ll definitely want to be familiar with the common terms in this guide. Applying for a personal loan? Then you'll want to brush up on some common terms you'll encounter during the process. By knowing these terms you'll be able to select a loan with the best terms for your situation. The concept behind a secured personal loan is simple: You borrow money against your assets. Your assets are used as collateral in the event that you miss payments or default on the loan. Houses, cars, and boats are all examples of common types of collateral used for secured loans, but you can also use your savings accounts or stocks. There are a few different scenarios why getting a secured personal loan would be your best option. These are the top reasons that people took out personal loans last year. For starters, it's much easier to qualify for a secured loan than an unsecured loan. If you have poor credit, it may be difficult for you to find a bad credit loan, but lenders are more likely to offer you money if you can put up collateral. Still, even if you have good credit, putting up collateral for a secured loan might be a great option for you as well. That's because secured loans typically offer more favorable interest rates. Again, this relates back to the idea of putting your assets on the line. In doing so, the lender perceives you as less of a risk, which translates to lower interest rates. Secured personal loans allow you to borrow more money, depending on how much your assets are worth and your equity percentage in those assets. When it comes to getting a loan, most lenders would want to see proof of a steady income, but if you own property, you may be able to get a secured personal loan even without having a job. With all of this in mind, there are still drawbacks to secured loans. If you can't pay back your debts, then you'll likely have to say goodbye to the property you put up as collateral, which could have a huge impact on your life if you put up something like your home. So just don't put yourself in a position where you agree to terms that you are unable to pay. Unsecured loans are extremely popular so it's important to understand just how they work. Borrowers get loaned money without having to put up any type of collateral and these loans can be used for just about anything. The terms of your unsecured loan will largely depend on your credit score, which is why it's so important for you to understand how credit scores work. By the way, in case you want to improve that credit score of yours, did you know that taking out a small personal loan just might help? Now take a look at how the interest rates can fluctuate based on different credit scores. Because it's a different type of loan, having it included in your credit report can add a boost to your score. For those of you with excellent credit, an unsecured loan is probably your best option. 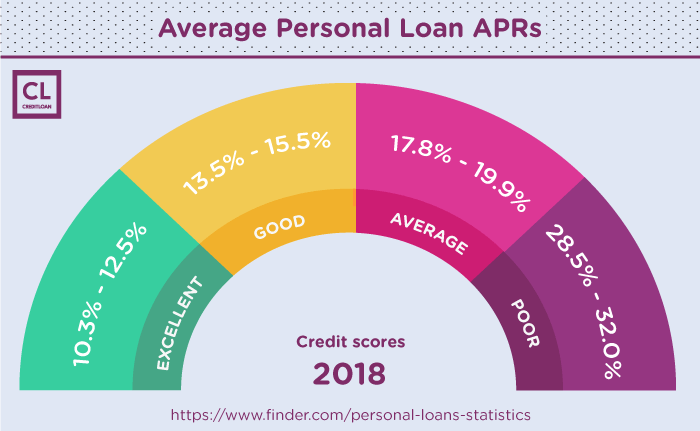 Even if you have a credit score that falls in the good or average range, financial institutions will still be willing to give you a personal loan, just at a higher rate. People with poor credit scores should consider alternative options, such as a secured personal loan, to avoid paying outrageously high-interest rates. You should always shop around for different loan terms, and see which lender will give you the most money at the lowest interest rate. Don't agree to terms that you're uncomfortable with! The most logical place to start your search for an unsecured personal loan is at your local bank but don't commit without visiting other banks. You may even consider setting up a meeting at a credit union as well. 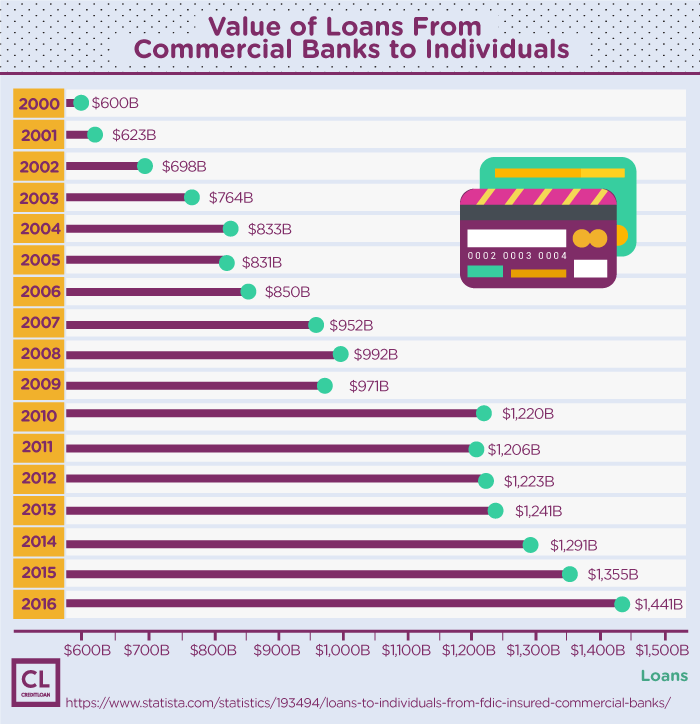 Since credit unions are owned by their members and operate as nonprofits, they are more willing and able to give borrowers favorable interest rates for unsecured loans. Co-signed loans are common for people with little to no credit history. For example, a young adult may get a parent to cosign a loan for them, and the lender will use the credit score of the cosigner to determine the interest rate and loan terms. This is great news for you if you know someone with excellent credit who is willing to help you out. Another benefit of a co-signed loan is that it will help you improve your own credit score if you can make payments on time—a great way to build your credit score from scratch! Co-signer loans are also an option for people with bad credit. The major drawback of a co-signed loan is for the co-signer, which is because they are taking on equal responsibility for the loan's repayment. With that in mind, should come as no surprise that the majority of co-signed loans are between family members. If you can't make your payments, then the co-signer will have to do so. Otherwise, it will also adversely affect their credit score aside from yours. So before you ask someone to co-sign your loan, make sure that they understand these terms and conditions. Lines of credit function in a way that's very similar to credit cards. Instead of the bank giving you a lump sum of cash, you'll get a credit line instead, and then you can borrow the money whenever you need it. One of the best parts about a personal line of credit is that you only need to pay interest on the amount that you borrow, as opposed to the full amount of the credit line. If you've got lots of high-interest debts to keep track of, this type of loan may be your best option. 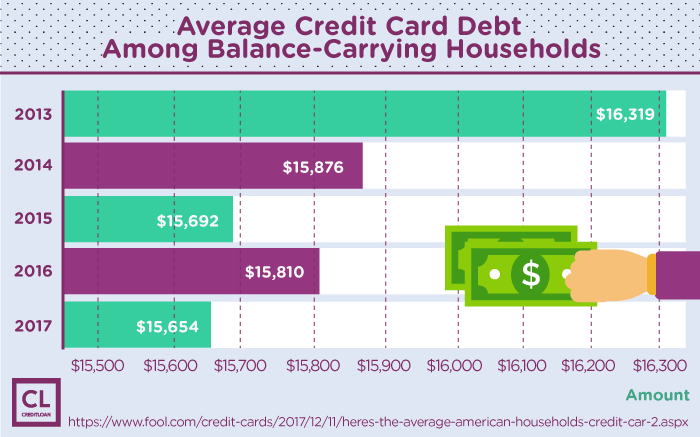 Let's say that you have three credit cards, all with outstanding balances. Rather than making three separate payments each month, you can take out a personal loan to pay off all that debt. As you can see, 2017 was the lowest that it's been in years, but with that said, it's still in the ballpark of $15,000, which is still high. Once you consolidate your debt with a personal loan, you'll just have to make one fixed monthly payment to pay back this new singular loan. In most instances, this type of loan will offer you lower interest rates than what you're currently paying, so it helps save you money on interest and simplifies your payment plan. Fixed-rate loans behave just as the name implies. Your interest rates and monthly payments remain the same for the duration of your loan. This is the best option for those of you who want to make regular payments each month. They also save you from the potential of rising interest rates on longer loans. Fixed-rate loans are also easier to budget, since you'll know exactly what needs to be paid each month. Variable-rate loans are a bit more complex. As you can tell by the name, the interest rate applied to the amount you borrow can change, but how does that work? In simple terms, here's how that works: Banks will set a benchmark rate, which gets tied to your loan, and when the rate fluctuates, so will your loan rate, along with your monthly payments and interest rates as well. There are pros and cons to this scenario. On the one hand, you could benefit from lower interest rates and lower monthly payments, but obviously, the risk is that these rates and payments could rise. You may be able to set up your variable-rate loan with a cap limit for how much it can change over a set period, as well as for the duration of the loan. But regardless, variable-rate loans are best for the short-term because it's less likely that there will be a drastic change in a short period of time. The main benefit of a personal loan is the fact that you can use your cash for just about any purpose. Do not apply the for first loan that you come across but rather, make sure you weigh your options. When it comes to selecting the right personal loan, there are factors that you should take into consideration—things like your credit score, the amount of money you need, and how long you want to pay it back for. Keeping these things in mind will help you narrow your search. Are you looking to apply for a personal loan yourself? What would you use the funds for, in case you get it?